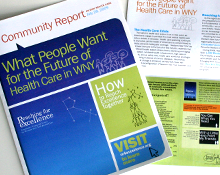 Reaching for Excellence seeks to improve the health care system in Western New York by monitoring and measuring system performance and serving as an ongoing forum where the voices of the community determine health care priorities. The effort emerged in 2007 as the first region-wide forum for engaging and amplifying the consumer perspective in regional health care reform. The UB Regional Institute was commissioned by the project’s sponsors – the Community Health Foundation of Western & Central New York, The John R. Oishei Foundation and the P2 Collaborative of Western New York – to manage this major research and community engagement effort. Facilitated by the institute, Reaching for Excellence convened more than 1,700 Western New Yorkers in One Friday: Four Futures, a series of community conversations about the future of health care in the region. Emerging from more than 100 community conversations were five key health care priorities, reflecting the top concerns of the region. Reaching for Excellence also featured a speaker series on best practices and communities of excellence in areas of health care that challenge Western New York. The institute coordinated the series, which included events on the aging population and rural access to care; the institute developed a special research brief for each event. The project culminated in July 2009 with the launch of an online tool developed by the institute to track regional performance on the five health care priorities, with a companion report also produced by the institute. Project sponsors have committed to sustaining regional dialogue on health care quality and tracking regional performance over time.